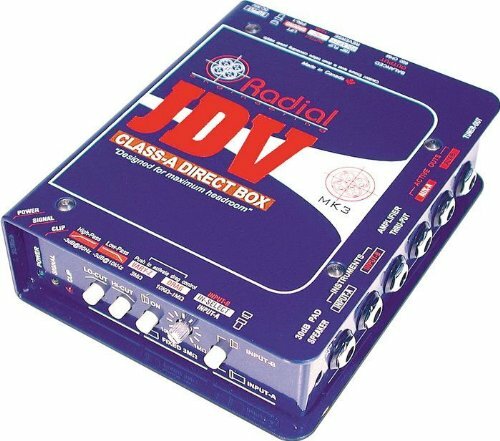 The Radial JDV Mk3 is arguably the most advanced and sonically superior direct box made today. With 100% class-A circuit and a 30-Volt internal rail voltage, the JDV combines exceptional sonic quality and unmatched dynamic handling for the most natural and uncolored sound possible. ? Class-A feed forward design ? Huge 30-Volt internal rail voltage ? Innovative Drag control ? Variable impedance to 3.9 Meg-Ohms ? Unique zoned design concept Designed as a creative tool, the JDV introduces a concept of ?Zones? with choice of two inputs, four instrument amplifier outputs, and a unity-gain transformerless output. Features include Drag control for precise pickup load correction, 3.9 meg-ohm input impedance for piezo pickups, hi-pass and lo-pass filters, full LED status indicators, polarity reverse and all of the other features one would expect from a Radial DI. The Radial JDV Mk3 is designed for use in both the studio and live performance and is suitable for all instruments where added reach is required and retaining the original sound of the instrument without distortion or coloration is paramount. If you have any questions about this product by Radial Engineering, contact us by completing and submitting the form below. If you are looking for a specif part number, please include it with your message.